As electronic devices get smaller and smaller, it has been a struggle for scientists to develop batteries that not only work efficiently, but are small enough to accommodate gadgets without bulking them up or weighing them down. It appears the tiny battery industry is making progress, because researchers have managed to 3D print a lithium-ion battery the size of a grain of sand. 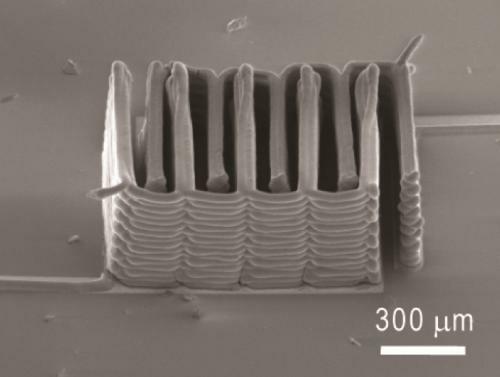 Developed by researchers at Harvard University and the University of Illinois at Urbana-Champaign, the battery was fabricated by a printer that interlocks electrodes as small as the width of a hair. The concept involves an “ink” that is made of electrochemically active materials that are layered to create small, interlacing stacks of electrodes that are then packaged together and filled with an electrolyte solution. Scientists were previously using thin, solid films to create electrodes, a technique that did not supply enough energy. Once the energy rate, life cycle, and charge were measured, the results came in that this battery was as effective as commercial batteries at only a fraction of the size. This has the potential to not only change batteries are produced, but to also impact the size and weight of popular gadgets. The results were published in the June 18 edition of Advanced Materials.